Need your Clutch City Garage Floor Painted? Call the experts at First Choice Painting & Remodeling. With over 22 years experience in applying paint (AKA epoxy) to garage floors in Clutch City, you're getting the local expert. When you call (832) 271-4712, you'll receive expert advice and skilled professionals to complete your Clutch City epoxy coating project. Creates a moisture-resistant barrier that inhibits the growth of mold and mildew; especially important during those hot and humid Texas summers! 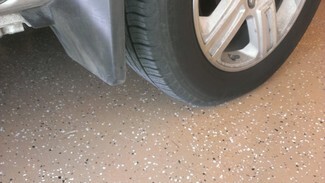 New technology has increased the options for garage floor epoxy coating application in Clutch City. You can choose just about any color imaginable. You'll also have the option to add texture with quartz or sand chips. These add interest to the finished floor look and have the added benefit of creating a low-slip surface. First Choice Painting & Remodeling can apply custom garage floor epoxy coatings such as metallic epoxy coatings for Clutch City garage floors. Give us a call at (832) 271-4712 to discuss your garage floor painting project and find out all of the options available.